As Congress begins serious consideration of reauthorization of the Higher Education Act (HEA) of 1965, as amended, legislation and related resources, including NASFAA comments and in-depth analysis, can be found on this page. This HEA Reauthorization page also offers HEA-related legislation from 2013-2016 and NASFAA’s HEA recommendations for Congress. 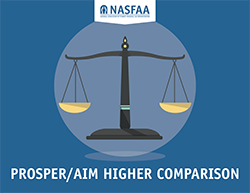 See NASFAA's comparison chart that illustrates the similarities and differences between the House and Senate bills. Also, see a compilation of all NASFAA Today's News coverage of the HEA Reauthorization. NASFAA and its members have also been hard at work analyzing the HEA and potential new policies. In 2013, NASFAA released the preliminary report of the NASFAA Reauthorization Task Force, and in July 2016, NASFAA updated the report to include subsequent work from NASFAA policy task forces.